Heilongjiang province, the place where the sun rises earliest in China and one of the original areas of New China's industrial development, is embracing a much brighter future focused on innovation and economic reform. On Nov. 12, the Ministry of Foreign Affairs of the People's Republic of China presented Heilongjiang province to the world with the theme of "China in the New Era: Heilongjiang, A New Path to Revitalization in Partnership with the World." State Councilor and Foreign Minister Wang Yi delivered a speech. He said that Heilongjiang province is speeding up innovation, upgrading growth engines, developing a new momentum through reforms, and creating new high points for cooperation to realize a fully fledged revitalization. Wang also emphasized that Heilongjiang obtained a unique advantage in China's new round of opening up, pointing out that the province would be heavily engaged in the building of the China-Mongolia-Russia Economic Corridor and the Belt and Road. He urged the world to grasp the new opportunities brought about by the deepening reform and opening up, and, in partnership with China and its promising Heilongjiang province, strive for a future that is mutually beneficial and involves win-win success. Zhang Qingwei, secretary of Heilongjiang Provincial Committee of the Communist Party of China (CPC), said that this area's fully fledged revitalization drive has stepped into a new era. The province would surely transform its natural advantages to new development engines, and exert every effort to build up a comprehensive opening up setup. 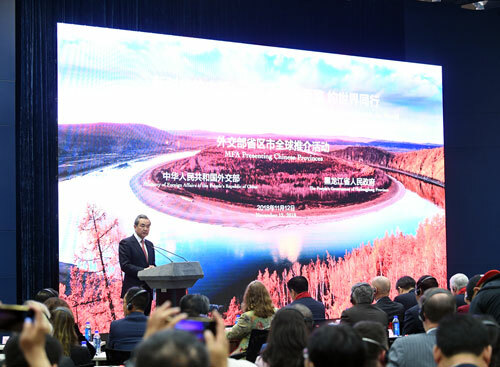 "We would like to share the opportunities of revitalization and development with the world, and warmly welcome foreign enterprises to invest in Heilongjiang," said Zhang, asking the audience to travel to the province this winter to experience its charms. Provincial Governor Wang Wentao also promoted Heilongjiang in terms of tourism, agriculture, equipment manufacturing, emerging industries, and international cooperation, and sincerely invited the world to work together for a community with a shared future for mankind. The Russian Ambassador to China Andrey Denisov, Finnish Ambassador to China Jarno Syrjala, Japanese Ambassador to China Yutaka Yokoi, and Dutch Ambassador to China Ed Kronenburg introduced the development of communications and cooperation between Heilongjiang province and their respective countries, all vowing to further strengthen the friendly relations and pioneer more cooperation areas. The event attracted representatives of international organizations, business elites and envoys from more than 120 countries.